Close-Out Sale! Just size 4 is left. A Rustic Holiday original outfit offers inspiration for looks to create from DapperLads separates and accessories. 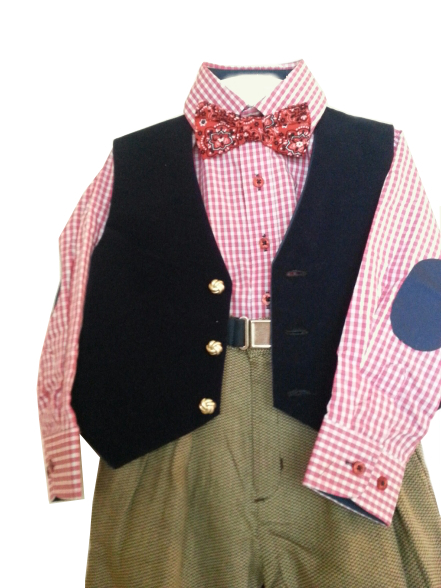 The 3 pc boys holiday set includes the shirt, vest and pants. The shirt is 100% cotton gingham check shirt in red with contrast navy elbow patches and inside the collar, button placket and cuffs. From Isaac Michael. The herringbone tweed pants are 100% cotton with pleats and elastic back. Straight leg. 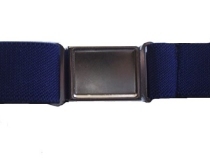 Paired with a navy velveteen-finish vest. 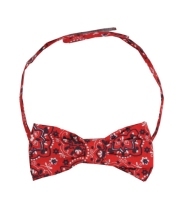 Note - The belt and bow tie are not included The belt and bow tie are sold separately as shown below. Add a cowboy hat for western style.